Chinese Premier Li Keqiang (L) and Afghan Chief Executive Officer Abdullah Abdullah attend a welcome ceremony at the Great Hall of the People in Beijing, China (May 16, 2016). Over the past two years, China-Afghan security cooperation has reached unprecedented levels. Today’s China-Afghanistan security relations, under Afghanistan’s National Unity Government (NUG), are closer than ever. The trend of increasing Sino-Afghan security relations, along with good diplomatic and economic relations, came after President Ashraf Ghani’s first trip abroad — to China in October 2014. There, he was warmly received by President Xi Jinping himself at the airport; during the visit, Ghani’s Chinese counterpart announced $329 million in Chinese grants. Since 2001, Beijing has been diplomatically and economically engaged in Afghanistan; however, since the establishment of the NUG, it is now slowly becoming practically engaged in Afghan security and defense affairs as well. Chinese security pledges and assistance are generally overestimated by some Afghans, but, one thing is certain — this is just the beginning of Chinese initiatives to help Afghan National Defense and Security Forces (ANDSF). More Chinese assistance will be crucial if Beijing really wants to successfully complete its One Belt, One Road initiative, including the China-Pakistan Economic Corridor (CPEC); remove its concerns about the emergence of the Islamic State; and eliminate safe havens for Uyghur militants in the region, particularly in the Pak-Afghan belt. Compared to the Cold War and immediate post-Cold War eras, China’s engagement in Afghan security issues is unprecedented. Beijing’s security interests in Afghanistan gradually increased after the Sino-Soviet split and particularly after Brezhnev’s call for an Asian Collective Security System in 1969. The Soviet proposal was designed as a plan to counter China in the aftermath of the deterioration of Sino-Soviet relations. However, despite many requests to join, Afghanistan never became a member in this Cold War-influenced security system due to its own “Durand line” issue (joining would have required Kabul to freeze its borders, against the government’s wishes) as well as opposition from neighboring China. During the Cold War but prior to the Soviet invasion of Afghanistan, Beijing tried to improve its diplomatic and economic relations with Kabul. Most importantly, China and Afghanistan signed a border agreement in 1965, making the Sino-Afghan border the only boundary to have been negotiated by Kabul independently. However, despite all these efforts, Beijing didn’t have defense and security relations with Kabul at that time. Their exchanges were limited to economic, political, and cultural relations. There were, of course, Chinese securities concerns, which motivated Beijing to look more closely at developments in Afghanistan at a time when China had strained diplomatic relations with the Soviet Union and had recently experienced a war with India (in 1962). Both the Soviet Union and India were actively engaged in Afghanistan. It wasn’t until Afghanistan was invaded by the Soviet Union in 1979 that Beijing began military assistance for the first time — not to the Afghan government, however, to the Afghan mujahideen. Beijing was shocked by the invaston and it feared encirclement from Moscow, as the Soviets and their allies were already in control in Vietnam and Cambodia. On December 31, 1979, the Chinese Ministry of Foreign Affairs told the Soviet ambassador that “Afghanistan is China’s neighbor… and therefore the Soviet armed invasion of that country poses a threat to China’s security. This cannot but arouse the grave concern of the Chinese peoples.” Later, Chinese deputy defense minister Su Yu said that China “would firmly stand by the Afghan people.” China boycotted the 1980 Moscow Olympics and supported United Nations Security Council and General Assembly Resolutions in favor of the withdrawal of Soviet Forces. When the Soviets withdrew from Afghanistan, Chinese security concerns increased once again. However, this time, with Afghanistan in a state of civil war, Beijing neither helped a particular group (as they did for the mujahideen during the Soviet invasion), nor did they assist the Afghan government, whether under Mohammad Najibullah Ahmadzai or Burhanuddin Rabbani. Chinese concerns in this period centered on the export of drug trafficking, extremism, terrorism, and separatism to China and the potential for Afghanistan to become a safe haven for its own militant groups, such as the East Turkestan Islamic Movement (ETIM). In the 1990s, Afghanistan was the world’s largest opium cultivator. According to the UN Office on Drugs and Crimes’ Afghanistan’s Opium Survey 2011, opium cultivation rose from 1995 until 2000, when Mullah Omar, the leader of the Taliban, issues a fatwa, or religious decree, calling opium cultivation against Islam. In 1995, opium was grown on 54,000 hectares; it reached 82,000 hectares in 2000. In 2001, opium cultivation dropped to only 8,000 hectares of land. Also during the Taliban’s rule in Afghanistan, many foreign extremists, particularly from Central Asian republics and China’s Xinjiang province, were present in Afghanistan. This was an alarming sign for the three Central Asian republics neighboring Afghanistan as well as China. Beijing sent a diplomatic mission to Mullah Omar in the late 1990s to get assurances that Afghan soil would not be used as a launching pad for terrorist activities in China. The Taliban’s supreme leader agreed. Afghanistan at the time was considered as a regular threat to Central Asia and the surrounding areas, as a hotbed of terrorism and safe haven for regional separatists and extremists. 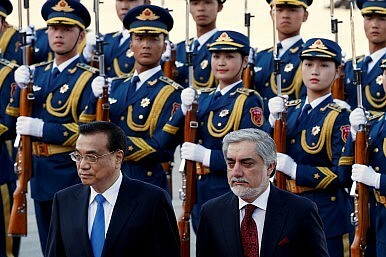 As a result, the Afghan security question indirectly paved the way for Shanghai Five (later expanded to today’s Shanghai Cooperation Organization), which initially “focused on mutual intraregional efforts to curb terrorism, separatism and extremism in Central Asia,” according to an official Russian government description. These concerns didn’t force Beijing to work with the Afghan government on security issues in the 1990s, despite repeated Afghan requests from Najibullah and Rabbani. In the post 9/11 era, by contrast, Beijing swiftly engaged with the Afghan government and steadily helped Afghanistan in many sectors. Despite this, there were still few bilateral contacts in the security and defense sector. Beijing only disbursed a few million dollars in security aid and trained a few dozen troops of the Afghan Security Forces. However, the security and defense relations between Kabul and Beijing have been steadily increasing under the NUG, compared to the either the Cold War or the Hamid Karzai era. After the establishment of the NUG in 2014, Sino-Afghan relations saw a new positive trend in bilateral relations. Not only have security-related bilateral exchanges, increased but for the first time China has announced military assistance to Afghanistan. Before Ashraf Ghani’s 2014 visit to China, the Chinese ambassador in Kabul said that both Afghanistan and China are victims of terrorism and hence Beijing is ready for cooperation in confronting this common threat. This was a green light for Kabul to seek (and receive) Chinese assistance in this regard. After Ghani’s visit, the Afghan government arrested and handed over 15 Uyghurs to China in February 2015. These Afghan promises and the act of returning Uyghurs to China became bargaining chips meant to gain security assistance from Beijing, and to further persuade China to use its leverage on Pakistan to start direct talks with the Afghan Taliban. At the end of the year, the Chinese spokesperson at the Ministry of National Defense (MND), Yang Yujun, summarized military hot spots in 2014 with the 26 letters of the English alphabet, starting with A for Afghanistan: “The NATO withdrew troops from Afghanistan with twists and turns.” S was for Syria, I for Islamic State and T for terrorism. The list offered more proof of Chinese concerns regarding Afghanistan, terrorism, and general security in the region. Also in this meeting, Ulomi asked for more cooperation in the training and equipment of the Afghan National Police. The Chinese side agreed to provide such training and equipment. In another meeting, Ulomi signed an agreement with China’s minister of public security. Moreover, the head of the Afghan Border Police also signed an agreement with the head of the Chinese border security forces. These two agreements called for cooperation to protect borders and ensure security in the border region, limit illegal cross-border migration, and curb drug trafficking on the Sino-Afghan border. To that end, China and Afghanistan agreed to more cooperation between their border police. China in particular pledged to provide bullet proof jackets, demining equipment, armored police vehicles, and devices to search automobiles for security threats. According to Ulomi, speaking in 2015, these materials would be handed over to the Afghan side soon. He also announced that 60 police would be sent to China for training. After the fourth meeting of the Quadrilateral Coordination Group presented a bleak future for direct talks between the Afghan government and the Taliban, a top member of the Chinese military visited Kabul on February 29, 2016. General Fang Fenghui, a member China’s Central Military Commission (CMC) and chief of the CMC’s General Staff, met top Afghan leaders (including the president, chief executive officer, national security advisor, and minister of defense). For the first time in the history of Sino-Afghan bilateral relations, Fang agreed to allocate 480 million yens ($73 million) to Afghan Security Forces. He also proposed quadrilateral cooperation against terrorism in the region, which threatens Chinese projects like CPEC and OBOR. Compared to the past trends, Sino-Afghan security relations under the National Unity Government of Afghanistan are going through an interesting transformation. Since the establishment of the NUG, Afghanistan and China have signed 4 MoUs regarding security and defense cooperation and bilateral exchanges between defense and security officials have also increased. In 2015, the Afghan minister of defense, minister of the interior, foreign minister, national security advisor, and other top security officials have visited China, while from Chinese side the minister of public security, vice president, and chief of the CMC General Staff have visited Kabul. However, this doesn’t mean that the China-Afghanistan security relationship is enough to fulfill Afghan needs or act as a substitute for Western assistance. The Chinese side to date hasn’t provided Afghanistan with heavy weapons or aerial assets. Interestingly, the Afghan side has not publicly requested such assistance (aside for interior minister Hanif Atmar asking for transport planes). However, when put in perspective it becomes clear that over the last two years Beijing has been slowly and gradually increasing its security relations with Afghanistan. Should Kabul in the near future succeed in acquiring heavy weapons, combat helicopters, or other offensive assets from Beijing, it would certainly be a “game-changer” for the region. Ahmad Bilal Khalil is an independent Kabul-based researcher and is currently writing a book on Sino-Afghan relations: 1955-2015 (in Pashto). He tweets @abilalkhali. Is China Bringing Peace to Afghanistan? China’s role in Afghanistan is undoubtedly growing. What does that mean for the peace process?